Yesterday, I wrote on my blog that if it had not been for Hitler, there would be no Israel today. One of the regular readers challenged this statement, pointing out the Balfour Declaration. In my blog post today, I am replying to the comment made by “skeptic” on my previous blog post about Hitler and Netanyahu. The reason that Hitler is sometimes called “the founding father of Israel” is because of “The Transfer Agreement.” This was an agreement between Hitler and “the International Jews,” made soon after Hitler was appointed the Chancellor of Germany in January, 1933. On August 7, 1933, Zionist leaders signed a pact with Germany in which Hitler agreed to transfer around 60,000 German Jews and $100 million dollars in Jewish assets to Jewish Palestine. In exchange, the Zionists agreed to halt their worldwide boycott of German goods, which they had declared as soon as Hitler came to power. The Jews who were sent to Palestine in “The Transfer Agreement” were the older, educated, rich Jews who became influential in the founding of Israel. They were sneaked into Palestine, as this was a secret agreement. The money that was transferred would be around a billion dollars in today’s money. Edwin Black wrote a whole book about the Transfer Agreement, which was first published in 1984. You can search inside his book on Amazon.com here. Black is the son of ethnic Jews from Poland who were survivors of the systematic campaign of genocide against the Jewish people by the fascist government of Germany and its allies. His mother Edjya, from Bialystok, had only managed to survive the Holocaust when as a 12-year-old in August 1943 she was pushed to safety by her mother and other prisoners through the vent of a boxcar en route to the Treblinka extermination camp. Did you catch that, Ray? Ray made a comment on my blog recently and I linked to his blog here. On his blog, Ray posed the question of what could have happened to the Jews who were sent to the Treblinka extermination camp. I previously blogged here about the Jews who were sent from Bialystok to Treblinka. 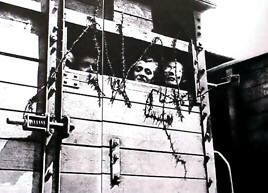 The photo below shows a “vent” in a boxcar of the type used by the Germans to send the Jews to death camps like Treblinka. At the age of 12, Edwin Black’s mother was pushed through a vent like this, and she escaped certain death at Treblinka. I am currently reading a book written by David Fromkin, entitled A Peace to End All Peace. The title is a reference to the ongoing lack of peace in the Middle East, which has been the unfortunate situation since the “peace treaty” at the end of World War One. Fromkin’s book was written in 1989 and he did not mention Hitler even once in the 576 page book. Apparently, he had not read Edwin Black’s book and he did not know of the role that Hitler played in the founding of Israel. Fromkin did write about how the British reluctantly kept their commitment to the Jews in the Balfour Declaration. Before Hitler came to power, the British were allowing only young boys and girls who had manual labor skills and farming skills to emigrate to Palestine. The Jews had set up schools in Germany where the young Jews could learn the skills necessary to qualify for emigration to Palestine. Hitler took over these schools and continued educating the Jews; he also set up farms where the Jews could learn agriculture. But it was not the knowledge of agriculture nor the skills in manual labor that paved the way for the state of Israel. It was sneaking of educated Jews and their money into Palestine that resulted in the founding of the state of Israel. Tom Segev’s book was originally published in Hebrew in 1991 and translated into English in 1993. Edwin Black’s book was written in English in 1984. Segev may not have known about “The Transfer Agreement,” since he didn’t mention it in his book.